An employee handled a call at the MBTA new &apos;centralized call center&apos; for the Ride in Malden. Over the past 17 years, Joyce Breda experienced the occasional hiccup with The Ride, a delay on her way to work or a doctor’s appointment. But nothing like the problems she’s encountered this year with the T’s door-to-door service for the disabled. One morning, her ride to work was waiting outside her office in Allston, instead of her home in Quincy. Another day, her ride home arrived nearly four hours late. In the past four months, Breda has missed three days of work and two medical appointments because of problems with the paratransit service. Since the Massachusetts Bay Transportation Authority launched an overhaul of the costly system four months ago, complaints like Breda’s have surged. In the first three months after creating a new call center for The Ride — February, March, and April — the MBTA fielded an average of 424 complaints, up from 325 a month over the preceding year, according to agency statistics. Totals for May and June are not yet availab le, but passengers continue to report problems. Meanwhile, The Ride’s on-time performance has dropped from its usual rate of above 90 percent to about 86 percent in June, state officials said. 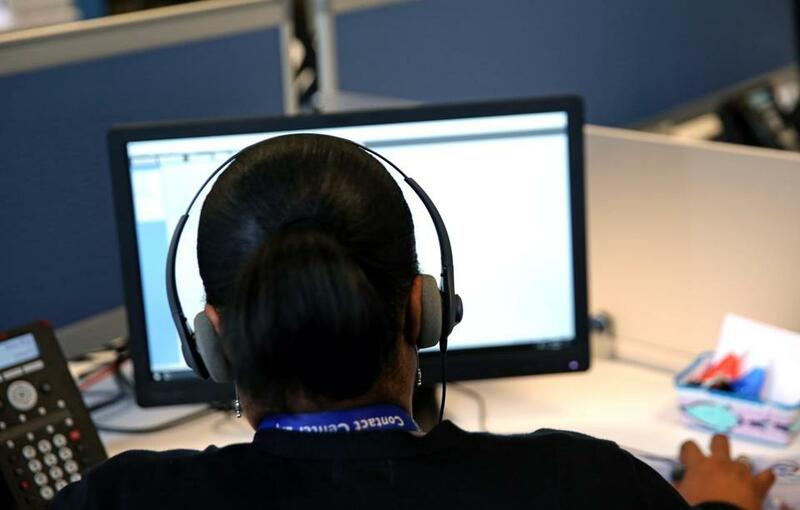 The problems have been so severe that the MBTA has fined the company running the new call center, Global Contact Services, $100,000 for wait times for callers and other issues, based on penalties spelled out in the contract. Passengers report they have waited for hours at medical offices for rides, had rides simply not show up, dealt with rude or unhelpful call center operators, and struggled to reach the center by phone, Villers said. Some passengers say the vans take them on circuitous routes that make little sense, said Bill Henning, executive director at the Boston Center for Independent Living, a nonprofit group that provides services to people with disabilities. Naomi Gray, a 76-year-old Roxbury resident, said her ride home from church one Sunday didn’t show up, evidently picking up a different passenger in her place. The complaints make up a tiny percentage of the more than 170,000 trips The Ride provides each month through three regional contractors. And MBTA officials say complaints might have increased because some customers could complain about both Global Contact and the service operator, generating multiple complaints for a single incident. But the MBTA and Global Contact acknowledge that the new system has had a bumpy start. “Anytime you go through an implementation and integration, there are going to be hiccups,” Global Contact chief operating officer Brian Overcash said. The new call center, which opened in February, consolidates scheduling and dispatching for the three regional companies that operate The Ride’s vehicles. Global Contact Services, a North Carolina firm that also runs the call center for New York City’s paratransit system, won a $38.5 million contract last year to run the center through at least 2020. So far, the call center is scheduling and dispatching vehicles for two of the three service providers. It will take on duties for the third company next month. MBTA officials say the new system carries several benefits. Instead of calling a service provider directly, passengers now call one number to arrange a ride, a shift that should lead to having more efficient routes, reducing operating costs, and eliminating the need to transfer between vehicles when traveling between regions, transit officials said. The MBTA is working to address the problems by ensuring the call center’s software is functioning properly. Merging the data and routing information from three separate call centers into one system “has produced the occasional anomaly in service provision,” said Michael Lambert, a deputy administrator for the Department of Transportation. While the software, which is licensed by the T, partially automates scheduling and routing, Global Contact is responsible for making manual adjustments throughout the day based on schedule changes or traffic issues. The company said it is ramping up hiring and training staff to better deal with such issues. About half of the 125 people working at the call center previously worked as dispatchers for the existing service providers, while the others are new employees. The center will eventually have 160 to 170 workers, Overcash said. The MBTA is also asking one of thetransportation service providers to put more vehicles on the road during peak hours to reduce delays. Shortsleeve said he believes the call center, through more efficient routes, will eventually provide better service at a lower cost, resulting in nearly $40 million in savings by 2020. The MBTA board is scheduled to discuss the call center further at a meeting Monday. The agency has long struggled to reduce the cost of The Ride, which costs the agency about $45 a trip. It has also launched a pilot program with on-demand ride-hailing companies Uber and Lyft that charges passengers just $2 a ride. The MBTA covers the balance of the fare, up to $13. Global Contact will eventually oversee dispatching for those rides as well. The MBTA has floated other cost-cutting ideas in recent years, including service cuts and fare hikes, but shelved them because of fierce resistance from passengers and advocates for the elderly and disabled.